Gone are the days when paper maps were the means of navigation, which had limited range and were susceptible to numerous damages. At this present era, the best truck GPS for drivers is an intelligent rig which is a must for every truck driver or operator. A vehicle owner understands the requirement of a good GPS tracker in everyday travel and more and more people are using it on a daily basis. When it comes to GPS for truck drivers, they are much different than the trackers used by automotive owners as trucks have navigational issues and demands that everyday GPS trackers fail to meet. As the demands are going high and many manufacturers are putting efforts in making a tracker, it is a challenging task to choose the right model. 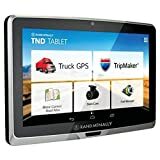 This article has narrowed down the best GPS for truck drivers for sale that has high efficiency and functionality and serves the purpose of GPS navigation well. Driving a truck requires a lot of concentration and undivided attention, the TomTom GPS navigator packs a smart design with appealing features and a 5” large display that enhances every journey. It has the function of voice recognition combined with Bluetooth hands-free calling that saves you the trouble of touching and tapping while you are driving. The use of an improved interface, contrasting and sharper graphics and more visible icons make the journey even more trouble-free. Moreover, the lifetime traffic and map updates are just what you need for perfect navigation. With the change of roads, the map changes and accurate updates you instantaneously with the real-time traffic so that your ride is not associated with any distress. A huge vehicle like a truck needs to have a clear idea about the road ahead as it is extremely hard to spin and turn a huge truck on every road. The Garmin Dezl is a Bluetooth portable GPS navigator that helps you have a tension free ride every single time. The 5” color touchscreen with white backlight rated at 480X272 pixels ensures that you have a clear view even in broad daylight. It also combines a specialized truck routing technology that can serve class 8 commercial vehicles. With lifetime maps and traffic updates, you will have a clear understanding of the road ahead of you and the lane assist with junction view feature is quite advanced in rewarding you with a hassle-free journey. It also adds a necessary location in the important NTTS breakdown directory. The TruckWay’s 720 is designed with a large 7” display that has LCD touch screen which displays high-definition 800X480 pixels imaging. Make every journey in your truck without any unwanted hassles as this device is intelligently designed to meet your needs. In the GPS, you can input the height, weight or width of the product you are carrying and the GPS will guide you through the roads and even display important warnings like a low bridge, no trucks and other important signs. Furthermore, it showcases 3D maps and 3D buildings for a smoother journey. It also has updated and accurate maps that can guide you well down the road. 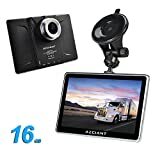 A GPS device that is specifically designed to deliver you an improved truck journey with many exciting and features that focuses primarily on eradicating hassles related to driving a huge automobile. The use of advanced lane guidance and split junction view combined with a 3D display ensures commercial truckers face fewer troubles on the road. The large 7″ display has preloaded maps that aids in an impressive navigation. Furthermore, it can also be used for many other purposes like route comparison, fuel entry logs, toll calculation, predictive traffic, and speed warnings. As soon as you connect it to the Wi-Fi, lifetime maps, live weather, live traffic and even fuel prices are in front of you. It also supports Bluetooth. A bigger screen display when you are driving is an added advantage that can make your journey much easier and trouble-free. The big 9″ display on the GPS navigator can be used for multiple purposes like display of real-time traffic so that you can choose the road as per your convenience and have a clear notion of the traffic, signal lights and speed limits beforehand. Furthermore, the smart manual voice search ensures a more secure and safe journey as your hands will be busy with the steering wheel. You can even use the device for entertainment purposes and surf the internet so that those long journeys do not bore you to the core. The 2 in 1 GPS navigator also allows you to use it as a dash cam and record every ride for future. The excellent GPS for truck drivers from Xgody is designed keeping many factors of the road in mind. The smart design comes along with a sunshade visor that can help you block those extremely bright rays of the sun that cause trouble to your drives and the night navigation system prevents reflective windscreen as well. Besides, it is Bluetooth compatible which enables you to make and receive calls on the go directly from the GPS. It also has 8GB of internal memory that can store a few movies and music for entertainment purposes and the all America updated maps make your journey on the unknown roads easier. The TomTom trucker GPS device can make your ride much easier as it can guide you with routes depending on the size of your vehicle, specifications of your cargo and other factors so you don’t have to rely on any guess works. It has a standout feature that allows you to have knowledge of the traffic on the route beforehand on both motorways and secondary roads, saving you any wastage of time. Besides, the lifetime truck map updates enable you to ride on the latest maps and road changes that you have no knowledge of. The ‘My Drive’ feature on the TomTom trucker helps you pre-plan and customize the route at any given point of time with the keeping the stops and roads in mind. Plus, being versatile you can use it for whatever you are driving. Be it truck, car, van or plane, it will assist you well. The advanced lane guidance system on the TomTom GPS Navigator is ideally designed to highlight the easiest driving routes and ensure that you do not miss out on a turn or exit while driving. It is manufactured with precision and has a 6” touchscreen display with junction view and split screen for enhanced driving even through the most complex junctions. Furthermore, it displays information about the delays ahead of you and helps you choose the alternative route to get you to your destination faster and easier. TomTom VIA also provides you with updated maps that will show you the road changes that has occurred without your notice. Undoubtedly one of the most loved models in the fields of GPS Navigators, the TomTom GPS device has impressed a lot of customers and gained their trust over time. It has high definition 6” display that shows you the maps at a pixel rate of 800X480 and packs all the features you need for a hassle-free journey. The lane guidance feature combined with a popular point of interests give you a clear notion about the route you will take and the route guidance is particularly designed for truckers for an optimal performance. Besides, it updates you with lifetime traffic as well as maps. No wonder it sits at top of the list. Truckers use their vehicles for a multitude of purposes and it is extremely important to have the right device on the truck to avoid any unnecessary confusion and road troubles. Hence, the GPS for truck drivers is what you need for your own safety.